A San Francisco–based neuroengineering company called Emotiv is developing a brain–computer interface that they say will be available commercially. The EPOC neuroheadseuses EEG technology to read electrical patterns in the brain and then sends this information through wireless signals to a computer. According to Emotiv, the headset will be used with new biofeedback games or can be incorporated into popular PC games like Harry Potter, where characters could pick up and move objects with the power oftheir minds. In addition, the EPOC could eventually be used in multiplayer online games like World of Warcraft or Second Life to control facial expressions of virtual game characters in real time. Emotiv claims theheadset can detect and replicate thirty different emotional and facial expressions, including excitement, anger, laughter, and calmness. 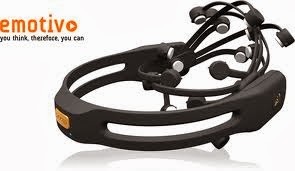 Unlike earlier EEG devices, the EPOC is the first commercially available EEG neuroheadset that does not require gel on the scalp or an elaborate net of electrodes, and will be sold for the consumer-friendly price of $299. The EPOC will bebundled with Emortal software, which enables you to use the headset to browse your computer files and applications, and also to connect to other Emotiv users in live chatrooms. This is guest post by C.C. Sullivan, Smartplanet. In terms of architecture, San Francisco is a very tasteful city, which is to say it can be a tad monotone. Its hills, bridges and vistas exhilarate, amply making up for the dearth of built thrills. That’s too bad. In other ways, the City by the Bay is magical and pioneering. It’s a hotbed of innovation in technology and public policy, two areas Mayor Ed Lee is now trying to bridge with hisentrepreneurship-in-residence program for “startups solving public sector problems.” This should set the stage for valuable experiments in architecture, right? Yes, theoretically. And urban theory is exclusively where we see the city’s most forward-thinking design work. On a recent visit, I witnessed San Francisco’s latent design innovation on display — for an alternative universe — in numerous venues in town and across the handsome, $6 billion new Bay Bridge, in Berkeley. One day, these audacious notions may lead to actual buildings and urban spaces. In the meantime, the grandiose ideas are mostly shelved but at least they are on view at two exhibitions of forthcoming and imaginary works. One of those exhibits is Unbuilt San Francisco: Ambition and Imagination, on view through December, which includes stunningly brilliant ideas that “never came to pass” as well as current schemes set for construction that couldradically alter the cityscape, should they go forward. The assembled photographs, original drawings, renderings and models are not only thought-provoking, they offer new solutions for serious challenges, too. Fougeron Architecture, for example, illustrates how “vertical agriculture systems” could be woven directly into the city’s streets, bridges and buildings to make the region super-sustainable. It’s a veritable dream come true for the ultimate foodie town. Other designs consider the city’s rising sea levels and shrinking watersheds, such as Kuth Ranieri Architects‘ Folding Water, a ventilated levee beneath the Golden Gate Bridge that could protect shorelines and contain tubes for high-speed regional trains. Marc L’Italien of EHDD proposes a retrofit of the Golden Gate with an industrial desalination plant and hydroelectric generators powered by the Pacific Ocean’s vast tidal forces. There’s more on tap, so to speak, in San Francisco’s unbuilt realm. One dream held by locals is to demolish the earthquake-damaged freeways that run through and over many neighborhoods.Mayor Lee’s recent idea to demo the Highway 280 stub and minimize a CalTrain railyard includes a vision of turning Mission Bay into a scientific and commercial hub. It’s not a new idea — the ugly double-decker Embarcadero Freeway was dismantled following the 1989 Loma Prieta quake, and the Hayes Valley also benefited from highway elimination. Responding to the spirit of the Mayor’s plan, the Center for Architecture + Design (CAD) along with the angels at the Seed Fund launched a competition called Reimagine. Reconnect. Restore: What if 280 came down? The results are astounding and on display at CAD and online. The Highlink idea from Brian Vargo, to be built when Mayor Lee closes Highway 280. Among the jurors forReimagine was the omnipresent Allison Arieff, former Dwell editor and New York TimesOpinionator columnist. She and others — likeJohn King, San Francisco Chronicle’s urban design critic — are behind these competitions and many of San Francisco’s best emerging ideas. They’ve also helped propel the city’s real achievements globally, especially as a tastemaker and innovator that often gets the idea done before New York and others. Yet their city needs more investment in design, as these idea expos prove. The mayor probably won’t be the catalyst. The leaders of the tech industry might be, if they can get their act together. Yet the theme this year — “Unbuilt San Francisco” — surely gives the wrong impression to the public. While it’s laudable to elevate great ideas and showcase the potential of what might be, we also need to criticize their failures and patrons. It’s time for San Francisco to concentrate efforts and resources to build these great places and technical feats, too. For this world-leading city, it’s only a matter of desire. Author, lecturer and consultant - Chris Harris is a true expert in the field. Trained as an engineer, Chris has been involved in various industries and has also been greatly involved with setting up a new governmental department in the U.K. known as Foresight. But Chris is probably known best for his work on the New Industrial Revolution, as he is a leading authority on the future development of RP technologies. He has written and lectured on the subject many times and is just beginning his campaign in the U.S. Read on and make sure that you are ready for the future of RP technology and industry - a future which Chris asserts is closer than you may think. Tell us a little about yourself. How did you become interested in your field? What was your education like? Later, I had a spell in commercial lighting, taking on the dual role of design engineer and CAD/Concurrent Engineering project leader. I cut my teeth in project management during that tenure. However, c.1992, I came across an opportunity in the aerospace industry that really appealed to me, and after five years, I made my way up to Aerospace Program director, driving the overall design, development and integration of new platform In-flight Entertainment Systems. I worked with dozens of aerospace companies. The more renowned include GEC, Rockwell-Collins, Boeing, American Airlines and British Airways. I thoroughly enjoyed that experience; the projects consisted of a diverse range of technologies, huge design and system engineering challenges, super-teams made up of hundreds of engineers, involving everything from systems analysis to mechanical engineering to industrial automation to product design to system integration, and more. The development labs looked pretty much like a scene from a Terminator movie.